In the last post, I referred to the Islands Trust as the Canadian version of the Friends of the San Juans. Some commenters have pointed out that my characterization of the Islands Trust is not accurate. I admit, the Islands Trust is structured differently from the Friends of the San Juans, since Islands Trust is actually part of the provincial government. Some have pointed out that the Islands Trust consists of democratically elected officials. Yes, they are "democratically elected" in a way that parallels the recent vociferous concerns about our Charter, in that the small islands participating in the Islands Trust have substantial and disproportionate influence. Perhaps, I should have said that the Islands Trust may be what the Friends of the San Juans aspires to be as it labors in league with the Puget Sound Partnership, Stewardship Network, and Northwest Straits Commission ... to be a formal governmental body with genuine clout. In the hope of getting my facts straight on the Islands Trust, I'd like to provide a description of them per the viewpoint and research of one of their constituents, Elizabeth Nickson, a Salt Spring Island resident and the former European Bureau Chief of Life. This is what Nickson has to say about Islands Trust in her most recent book. Salt Spring and its four hundred sister islands big and small are run, for the most part, by a land-use outfit called the Islands Trust, the much quoted mandate of which is "to preserve and protect." Founded in a summer graduate seminar at a local university in 1974 out of a fear that the pastoral islands scattered between Vancouver and Vancouver Island were about to be overrun by developers, the proposal for it was rushed through a session of the provincial legislature and its structure codified. The trust practices what is called fortress conservation, the typical form of conservation everywhere, which involves locking down as much land as possible and practicing "natural regulation," meaning no one touches it. Ever. Even "disturbing vegetation" is disallowed. For most of recorded history, humans have practiced adaptive management of resources --- when a problem crops up, we solve it. If we want a landscape, we create one; a working forest, ditto. Rangeland, farmland, townscapes --- all can be managed for bounty and health of resources and people. Natural regulation cropped up in the 1960s in almost all land-use agencies in the world and swiftly became the preferred method by which all resources and land were to be managed. Over the past five decades, natural regulation has been adopted almost everywhere. Nature knows best. Man is a virus and a despoiler and must be controlled. The Islands Trust went on to serve as a template for many similar organizations all over the world, including the California Coastal Commission and the Cape Cod Commission. The trust claims it is unique, but it is not, at least not anymore, and like its fellows, it differs from typical democratic government principally by subverting the normal processes of democracy in the name of good green land use. There are thirteen larger islands in the trust area, to which the smaller ones are attached for administrative purposes, and those larger islands elect two trustees each. When I say big, it's relative. Most of the twelve other islands have a population between four hundred and one thousand, but they each have two trustees. An off-island trustee comes in for the monthly town meeting to vote, breaking any tie. All land-use decisions are first voted on on the island and then considered at a quarterly meeting of all twenty-six trustees, called the Trust Council, which moves with all the glacial formality of the League of Nations. There is, you have no doubt gathered, no proportional representation at the trust. Salt Spring has only 8 percent of the final vote on the way any of its land is used, and in rural areas, land use is just about everything. The trust is a blue-chip organization; it is expensive, head-quartered in British Columbia's capital city, with forty-five full-time employees and a steady flow of consultants. From its offices streams an unending flood of glossy propaganda about ecosystems saved and dangers advancing that require more land to be saved and more regulations placed on private land, and of course on all waters, whether runoff ditch or ocean. Every few years, each island puts itself through a revision of its Official Community Plan. Carefully selected islanders serve on committees examining each "problem" within the trust region: affordable housing, tourism, economic development, water. Environmental movement goals are codified and tested during these thrash-tests of "participatory democracy" --- goals like limiting house sizes to less than three thousand square feet, for instance. Or requiring a permit and the consultation of a registered environmental professional ($2,500 fee to be borne by the applicant) to plant a garden within 100 feet of any body of water, man-made or natural. Or requiring a 150-foot setback from the ocean for any house, and if a house already within that 150 feet burns, it cannot be rebuilt in the same place --- well, tough luck for the stinking-rich oceanfront homeowner who just met Nemesis. The outcome of a year or so of such meetings, displays, and "community consultation" is an astonishing maze of regulation, the result of which is stasis and worse. Despite living within easy reach of three gleaming modern cities filled with active wealthy-ish men and women, with the exception of Salt Spring, which is graying rapidly, every island's population is in steady decline, losing young families every month. On the smaller islands, as the young leave and the economy deflates faster, even the elderly, deprived of the services that the young provide and fund, leave too. While the trust is supposed to deal only with land use, in typical bureaucratic mission creep it calls itself a local government. But in fact, all the other multiplying details of actual government are handled by a regional director, who spends his life dashing from committee to committee, all staffed by volunteers. ... Salt Spring is typically described as an argument surrounded by water, as, I was to find, is every other community into which the movement has inserted its brand of land-use management. Does any of this "democracy" sound familiar? And we send Councillors to meet with these people every year? Last year, San Juan County voters approved Proposition 3 by an overwhelming 85%. Proposition 3 requires all meetings of the County Council and all committees thereof to be open to the public except when a private (executive) session or closed session is allowed by law. Then how is it that Jamie Stephens and Rick Hughes have been spending so much time together lately out of the public eye? They both attended a conference on Mayne Island, Canada, sponsored by the Islands Trust. Islands Trust is the Canadian version of the Friends of the San Juans. Also, prior to leaving for the conference, they had lunch together at Haley's in Friday Harbor to discuss what they were going to say at the Canadian meeting. If you watch today's Council session video, you can see them discuss it (see time mark 25:30 to about 30:47). If you watch the video, you'll see our new Council members ask that the public be patient with them as they try to deal with their new jobs. Why does following the mandate of Prop 3 require patience? It's about as simple a mandate as could exist. At worst, Hughes and Stephens showed outright contempt for the will of the voters (and the law). At best, they showed extremely poor judgment. It was very bad form, and I think voters are out of patience regarding bad form by County government. It often seems as if the laws here only apply to homeowners. To that end, the Friends are advertising for an intern to aid their efforts to continue to beat up on all of us. The Friends aren't an environmental organization so much as they are a law firm specializing in friviolous lawsuits and hardball, self-serving, pseudo-science advocacy. They're looking for interns to keep it going. Position Description: Summer interns work under the direct supervision of Friends’ staff attorney to develop and prosecute environmental litigation and other advocacy efforts. The summer intern will gain practical litigation and policy experience by analyzing local, state, and federal statutory and regulatory environmental protections. Areas of practice may include the federal Endangered Species Act, Clean Water Act, and Clean Air Act, and Washington’s State Environmental Policy Act, Growth Management Act, Shoreline Management Act, water quantity and quality legislation, and Land Use Petition Act. Tasks may include attendance at citizen committee meetings and other public hearings, evaluating proposed ordinances, review and comment on shoreline and inland development proposals, statutory and case law research, drafting written memoranda, delivering oral testimony to local and state decisionmakers, and enjoying the San Juans’ natural beauty, from shore to sky. The Friends have been busy. Together with Futurewise, they held three grant-funded messaging sessions disguised as "Shoreline Science Forums" (Lopez - May 10, San Juan - May 17, and Orcas - June 4). Also, they have been busy opposing shoreline stabilization projects on San Juan Island, objecting to projects by the Woodmans (project approved), Laufers (awaiting decision), and Dickinsons (awaiting decision). In addition, the Friends continue to crank away on their CAO appeal to the Growth Management Hearings Board (GMHB). One of the interesting claims made by the Friends in their GMHB filings is the notion that tourists to the San Juans have "investment-backed expectations" regarding their experiences here (i.e., tourists don't want to see no stinkin' houses). The Friends' relationship with tourism is a flip-floppy one. They back the Scenic Byway and like to use the supposed interests of tourists to justify anti-resident initiatives like the CAOs. However, the Friends are simultaneously opposing expansion of camping sites and RV hookups at the Lopez Islander Resort. On June 7, they held an informational meeting on Lopez with opponents of the proposed Islander expansion. I wonder if the residents who oppose the Islander expansion have any idea that the Friends would probably like to get rid of them even more. 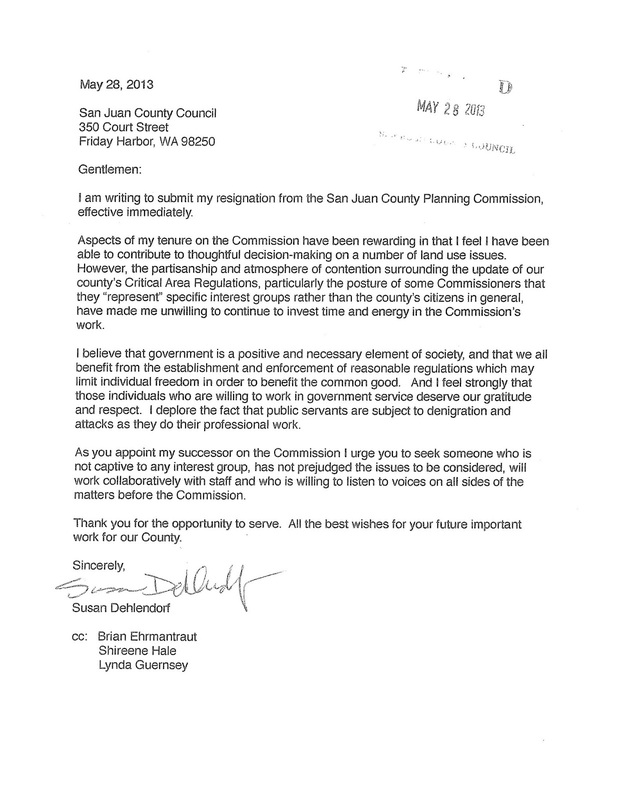 Susan Dehlendorf resigned from the Planning Commission. In her resignation letter (posted below), she said "I feel strongly that those individuals who are willing to work in government service deserve our gratitude and respect. I deplore the fact that public servants are subject to denigration and attacks as they do their professional work." 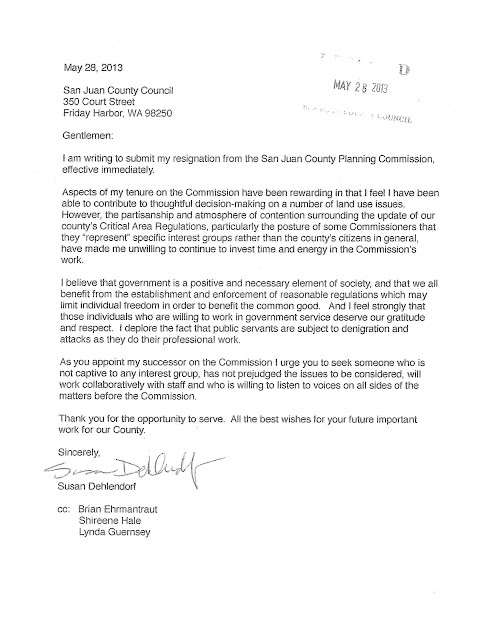 And despite those expressed sentiments, in the very same letter Dehlendorf denigrated some of her fellow Commissioners (who are all volunteer public servants) by characterizing them as partisan representatives of special interests. In an interesting development, the former President of Mexico, Vicente Fox, visited the San Juans along with investors (Jamen Shively) who seek to capitalize on the legalization of marijuana in this state by developing national marijuana brands. The leadership group for this effort held a symposium last weekend on San Juan Island on the topic of marijuana and cancer. Some residents here are beginning to ask whether the San Juans should somehow get in on the ground-floor of what many are calling the "Starbucks of Pot." Lastly, the San Juan Journal has started a blog. We wish them the best of luck, and if you happen to stop by to read their blog, be sure to come back here and let us know what you think. Leave a comment.